AT&T Inc. (T.N) was cleared by a judge to take over Time Warner Inc. (TWX.N) in an US$85 billion deal that will fuel the mobile-phone giant’s evolution into a media powerhouse and could spark a wave of new mergers. U.S. District Judge Richard Leon on Tuesday rejected the Justice Department’s request for an order blocking the Time Warner acquisition, saying the government failed to make its case that the combination would lead to higher prices for pay-TV subscribers. The judge put no conditions on the deal. Time Warner gained as much as 5.8 per cent in after-hours trading, while AT&T fell as much as 3.9 per cent. After nearly two years, AT&T is on the cusp of completing its acquisition of Time Warner, a deal it struck in a bid to become an entertainment giant that can feed Time Warner programming like HBO and CNN to its 119 million mobile, internet and video customers, and go head-to-head with Netflix Inc. and Amazon.com Inc.
"We think the evidence throughout the trial was quite clear and we’re very pleased that the court saw it the same way," said Daniel Petrocelli, AT&T’s lawyer. The company said in a statement that it plans to complete the takeover on or before June 20. The Justice Department can appeal and could ask an appellate court stay the ruling, though Leon said he hoped the government would have the "good judgment" not to do so. The Justice Department’s antitrust chief, Makan Delrahim, said he was disappointed and will consider his next steps. The judge’s decision could open the door to other mergers, including Comcast Corp. making a formal bid for the 21st Century Fox, which gained as much as 7.3 per cent after the ruling and is also the target of competing interest from Walt Disney Co.The decision also may make it easier for Verizon Communications Inc. to buy a content company and clear the regulatory path for deals Cigna Corp. and CVS Health Corp. have already announced. All of those deals would unite companies in different parts of an industry’s supply chain. For years, these so-called vertical deals have typically received light treatment from antitrust enforcers, unlike the horizontal mergers that bring together direct competitors. Opposition to the Time Warner acquisition marked an aggressive turn by the Justice Department. Leon described part of the government’s case as "gossamer thin," saying that during the trial the Justice Department’s expert witness declined to back some of the government’s own theories. "I conclude the government has failed to meet its burden to establish that the proposed transaction is likely to lessen competition substantially," the judge wrote in his opinion. Leon said the government fell "far short" of showing that AT&T’s new Turner Broadcasting unit would have increased leverage in negotiations with distributors. He rejected testimony by distributors who said they were worried Turner would be able to raise prices. "The bulk of the third-party competitor testimony proffered by the government was speculative, based on unproven assumptions, or unsupported -- or even contradicted -- by the government’s own evidence," Leon wrote. The judge found similar deficiencies in the government’s other theory of harm to customers: that the deal would stunt development of streaming services. Leon’s decision is a blow to Delrahim, who brought in a new enforcement approach with the case. The government’s November lawsuit was also the first major merger challenge under President Donald Trump, who railed against the tie-up when it was announced during the 2016 campaign. He vowed that his administration would oppose it, and as president, he has relentlessly attacked CNN for its news coverage. Trump’s criticism prompted speculation that the lawsuit was politically motivated. Still, the Justice Department’s case laid out a traditional antitrust theory: that combining two companies in different parts of a supply chain can give the merged company the ability to harm rivals. 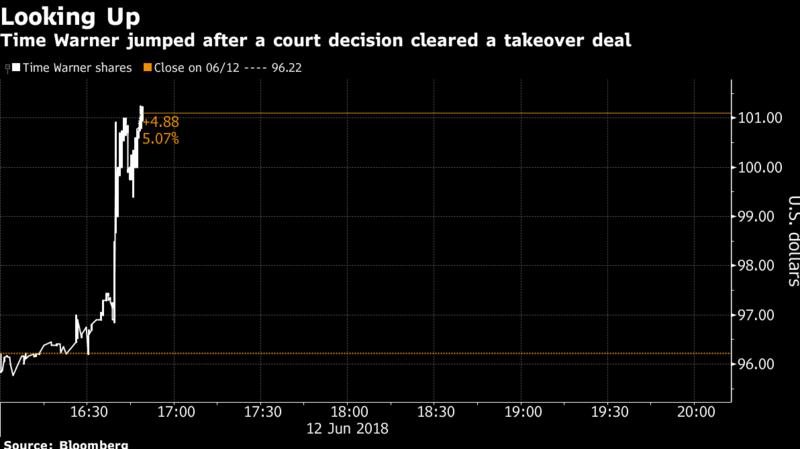 The suit stunned investors and antitrust lawyers because it broke with years of past practice for reviewing such deals, known as vertical mergers. Rather than negotiating an agreement that imposes conditions on how AT&T can conduct business, Delrahim demanded AT&T sell businesses to address threats to competition, which the company refused to do. "This is extremely bad for DOJ," said Chris Sagers, an antitrust law professor at Cleveland-Marshall College of Law. "This is probably the end of meaningful vertical enforcement for a good long time." After Delrahim took over the division, he announced that the department would require asset sales to remedy harm to competition from vertical deals. Leon’s ruling raises the question of whether Delrahim can successfully maintain that stance. The Justice Department claimed that AT&T’s acquisition of Time Warner would give the No. 1 pay-TV provider increased bargaining leverage over rivals like Dish Network Corp. that pay for Time Warner programming. Because of AT&T’s ownership of DirecTV, it can drive a harder bargain with other distributors that want Time Warner content, the government’s lawyers argued during the trial. If negotiations break down and rivals can’t secure that programming, their customers could switch to DirecTV, the lawyers said. That leverage would allow AT&T to raise prices for Time Warner content, with those costs being passed on to consumers, according to the Justice Department. The government’s case hinged on an economic model produced by Carl Shapiro, an economist at the University of California at Berkeley, who predicted an annual price increase to consumers of at least US$285 million. AT&T attacked that projection as baseless, repeatedly poking holes in the various inputs Shapiro used to calculate the estimate. In his opinion, Leon said Shapiro’s analysis had so many problems the government started backing away from it. "I couldn’t help but notice that the more and more questions were raised during trial about the reliability of Professor Shapiro’s theory and model, the more the government appeared to be minimizing the importance of his analysis," the judge wrote.